I love this little elephant and bought it for my new niece as part of her “Welcome to the world!” gift basket. 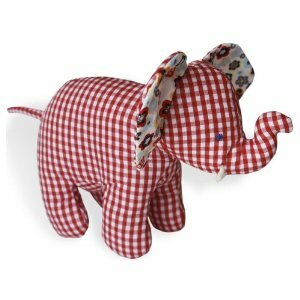 I won’t pretend that an infant will play with it (they’re not into stuffed animals), and I can’t promise it will become a favorite later, but it’s a lovely classic shape and a bright, friendly addition to any nursery. If you’re looking for a little something something to include with a shower gift (diaper disposals are practical and very much a must-have for parents, but let’s face the fact that they’re not exactly adorable! ), you can’t go wrong with our little pachyderm friend here. Great for a boy or girl and small enough that he won’t clash with any decor.